Suburban sprawl doesn't inspire you. You’d happily trade the sound of morning traffic for rustling trees. You crave the sight of rolling hills and the smell of fresh-baked bread. You long to simplify. LAND HERE. Offering One Bedroom, Two, and Two Plus Den Apartment Residences in Simsbury, Highcroft Ridge’s beautifully appointed residential apartment homes boast a long list of inspired details. Bright, open floor plans, kitchens with richly stained Shaker-style cabinetry with dovetail drawers, stainless steel Euro-style hardware, subway tile backsplash, and crown molding. 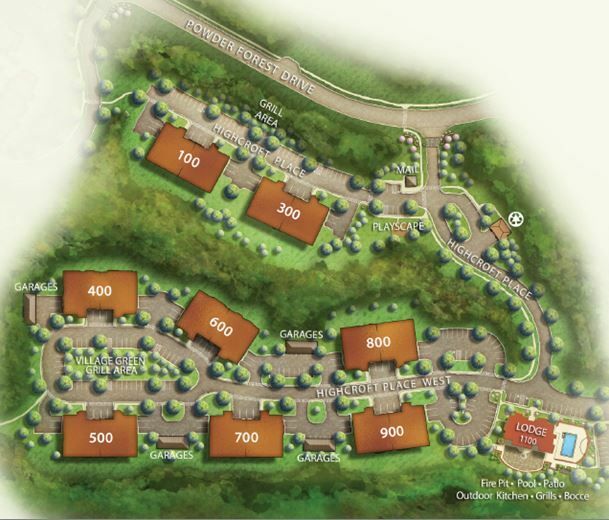 At Highcroft Ridge, there are garage options galore: most homes come with an in-building or direct access garage. If your home doesn’t come with a garage, you can rent one. Also, additional detached garages are available for rent for a second car.